Heat oven to 450°F. In large bowl, stir Bisquick mix and 1 1/3 cups milk until soft dough forms. Drop dough by spoonfuls onto ungreased cookie sheet. Bake 8 to 10 minutes or until golden. Break up biscuits. Butter bottom and sides of rectangular pan, 13x9x2 inches. Spread biscuit pieces in pan. Sprinkle with pecans and raisins. In large bowl, beat all remaining Pudding ingredients with electric mixer on low speed until blended. Pour over biscuits in pan. Cover and refrigerate at least 2 hours but no longer than 8 hours. Heat oven to 350°F. Stir mixture in pan. Bake about 1 hour or until top is golden and toothpick inserted in center comes out clean. Meanwhile, in 2-quart saucepan, heat all Orange Sauce ingredients over low heat 5 to 10 minutes, stirring constantly with wire whisk, until slightly thickened and temperature reaches 165°F for 15 seconds. Serve warm over pudding. Store covered in refrigerator. Make an extra batch of the Orange Sauce to pour over fresh berries or sliced fruit. Nothing ever went to waste in the soul food kitchen. 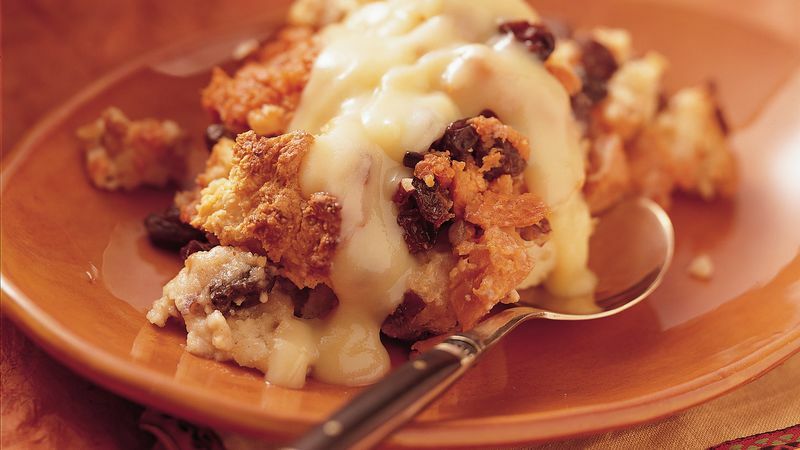 Stale bread became bread pudding, dating all the way back to the 1800s. This updated variation is made with quick-to-fix biscuits.